Hello beauties,i wanted to do a different kind of post today and whilst doing some research I came across the ’30 Beauty Questions Tag’, today I will be doing this tag! I remember my first makeup very clearly. It was a big set from Argos, something along the lines of pretty pink. It included a very orange foundation, lots of bright colourful shadows and some bright red/berry lip colours – I adored it! 2. Decribe your perfect mascara. Have you found one that’s fits your specifications? My perfect mascara is ‘Benefits There Real’ non clumpy, lengthening mascara. I also love mascaras that kind of wing your eyelashes outwards so the are shorter on the inner corners than outer corners. If I’m wearing foundation I want a full coverage otherwise I just wouldn’t wear it. If I wear foundation I go all out! Urban Decay plus Jeffree Star. Kat von D, and actually NYX I’ve never trying one of their products before! I know what I’m doing payday. Collection, Revolution also Rimmel London! Nope, i don’t know if this is just me but they feel so heavy on my lashes my eyes actually become tired. It’s too much hassle. Sometimes I will put my glasses on to get away without wearing eye make up as the glasses make them look bigger, so I’m that situation it would be concealer! Hoola bronzer! It works as a eyeshadow, contour and bronzer. Love it to pieces. 10. How often do you shop for makeup? Do you like to pick up a item here and there or get loads of goodies at once? I definitely like to get lots of goodies at once, I find it way more exciting however I only shop of makeup on payday once a month. 11. Do you have a ‘beauty budget’ or do you spend freely? I only allow myself to spend up to £50 on makeup a month, for example if I want an item that costs £50 I will only buy that whereas if I wanted products costing less I will get more. I have a boots and super drug card, they save you a lot of money if you shop there frequently. 13. What type of product do you buy most of? Not that I’m aware of yet. 15. Do you avoid certian ingredients in cosmetics like parabens and sulfates? Not completely but I do try. 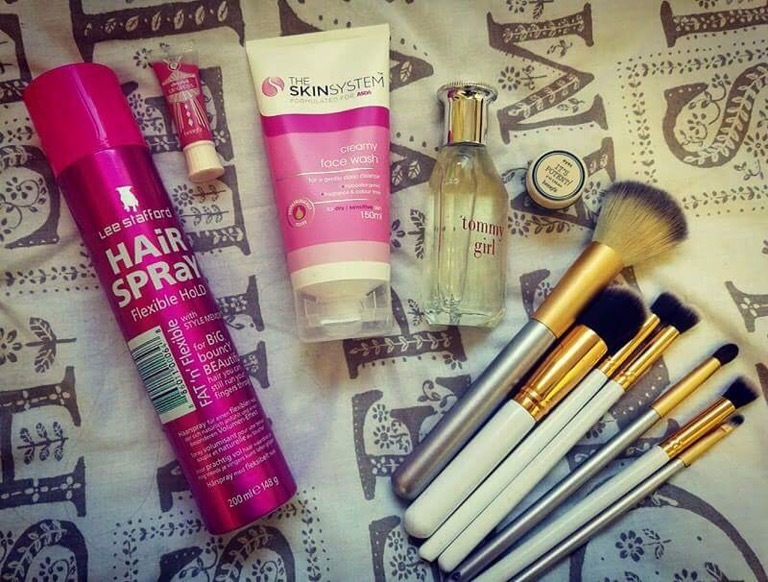 SUPERDRUG! They always have 3 for 2 deals going on and have a huge range of products. For high end I like to shop at House of Fraser. 17. Do you like trying new skincare products or do you keep a certian routine? I like keeping to products I trust but this month I will be trying so,e new things I have had my eye one. Benefit, I’ve never been disappointed with a product from them before all their makeup is incredible. I like 17 packaging its just really pretty and sturdy. Kylie Jenner for a full face full coverage look. Gigi Hadid for a more natural look. I can’t stand lip and cheek stains. I love them only for the lips. I could lie and say I’m not but I am. The worst one is sneezing just after putting eye makeup on or making my lipstick perfect but forgetting to brush my teeth before so I ruin my lipstick with toothpaste. I love Urban Decays Primer Potion for the eyes, for face I tend to mix it up a lot I haven’t found a favourite yet! Tresemme shampoo and conditioner, GHD straighteners and Argon oil on the ends. 28. What do you apply first foundation or concealer? Foundation, then concealer I wouldn’t have it any other way. I want to go back to college to study media make up but I learn loads from YouTube! I love being able to use makeup to make me feel more comfortable and confident in my skin, hide my imperfections and make my best features shine! I love being able to change looks to suit the occasion, you can do so much with makeup it’s a truly incredible thing. You don’t have to wear makeup to feel beautiful however it’s makes me feel beautiful that’s why I use it, that extra confidence that it gives me really helps me. That’s all for now girlies, leave a comment or do this tag I nominate you! I hope you enjoyed reading this post and I will see you again tommorow as I am now doing daily blogs! Hiya girlies, I was doing some research and I found out some very interesting facts about cosmetics and I wanted to share them with you! 1. Women used to pinch their cheeks to give themselves rosy cheeks before blush was invented. 3. In 3000 B.C. People wanted to be pale they had to “bleed themselves” by using leaches or cutting into a vein to achieve this look. 5. The most common injury caused by make-up is scratching the eye with a mascara wand. 6. In 1952, roll on deodorant was inspired by the ball-point pen. I hope you found these facts interesting. I certainly did!